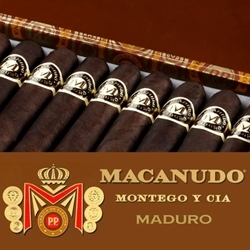 If you’re a Maduro cigar enthusiast, Macanudo Maduro premium cigars are just right for you. These hand-rolled premium cigars consistently receive high ratings as one of the mildest, most flavorful Maduro cigars on the market today. Macanudo Maduro are handmade to perfection from the finest cigar rollers in the Dominican Republic. They combine the best Dominican Piloto Cubano and Mexican San Andres fillers together with an exquisite Mexican San Andres binder. Only the best dark oily Connecticut Broadleaf wrappers are used to complete these premium cigar gems. Overall, the Macanudo Maduro’s offers a very smooth and mild flavor with an easy draw, and short finish. We here at Smokers Discounts believe you'll love the Macanudo Maduro premium cigars. We’ve made it easy and affordable to buy these premium cigars online. A variety of sizes and flavors are listed below for a discount price! Call us for more details!